Return to Narnia. Relive the Magic. Remember the King. 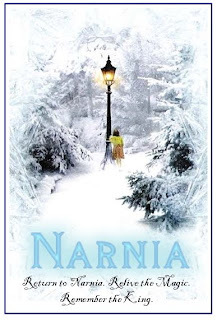 This year's Christmas show for children was a re-write of the first book and movie in the Chronicles of Narnia series written by C.S.Lewis. It was also done in connection with the release of the third movie in the series by Fox entitled, The Voyage of the Dawn Treader. We encourage all families to see this film while it is in the theatre to send a message to hollywood that the public wants more wholesome Christian films and less garbage media. For our show we featured seven different sets: Beaver's house, Tumnus' house, Jadis' castle, winter Narnia, the Professor's house, Cair Paravel, and our Eye Witness News studio. There were forty-seven different scenes and each actor was given five days to prepare and memorize their lines. There was only one practice, a two hour dress rehearsal on Saturday. The team then peformed the show one time on Sunday morning in a one hour and forty-five minute production. The result was almost flawless and simply amazing. The sound, lighting, and two of the backstage people did the whole production without a single practice run. We have some simply amazing young people and adults working in our children's ministry. A special thank you to everyone who made this year's production possible. An additional thank you goes out to Scott Dodson of the Church of the Open Door for his loan of his Wardrobe Curtain and Craven's Nursery for loan of their giant stone cat. If you wish to purchase a copy of the production, please contact Pastor Josh: jbaker@capitalbaptist.org. The photos below plus additional shots from the production can be found on our Snapfish account. For info on how to access Snapfish, click here.